Gerbils are mouse-like rodents from the family Cricetidae, that inhabit the drier regions of Asia and northern Africa. In the wild there are almost 100 different species of gerbil, but most pets are Mongolian gerbils, Meriones unguiculatus. They are very social animals and both parents take care of the young. Most gerbils live in a dry climate that is usually very hot in the daytime and in the northern ranges the temperatures may get very cold at night. Gerbils tend to stay inside their burrows during the hottest parts of the day and coolest parts of the night. The temperatures within the burrow are more moderate than the temperatures outside. Since many gerbils live in deserts, the ability to process water efficiently is an important survival adaptation. Gerbils usually do not have access to bodies of water in the wild, so they get most of their water from the plants they eat. Much of that water is retained in the fat cells of their bodies. Gerbils produce only small amounts of very concentrated urine and their feces is very dry, so little water is lost in their waste. Food can also be scarce in the desert, so gerbils hoard seeds and vegetable matter in the burrows. Gerbils have several physical adaptations that help them avoid predators. Gerbils have much less odor than other rodents, such as rats and mice. Their coloration in the wild is usually light brown, which blends in well with the desert surroundings and makes them less visible to birds of prey. They have excellent hearing, which may warn them of danger, as well as good peripheral vision. Thanks to their strong back legs, gerbils are also excellent jumpers. Their long tails help them maintain balance while jumping. If a gerbil is caught by the tail, part of the tail will slough off, allowing the gerbil to escape. Unlike lizards, the tail of a gerbil will not grow back. 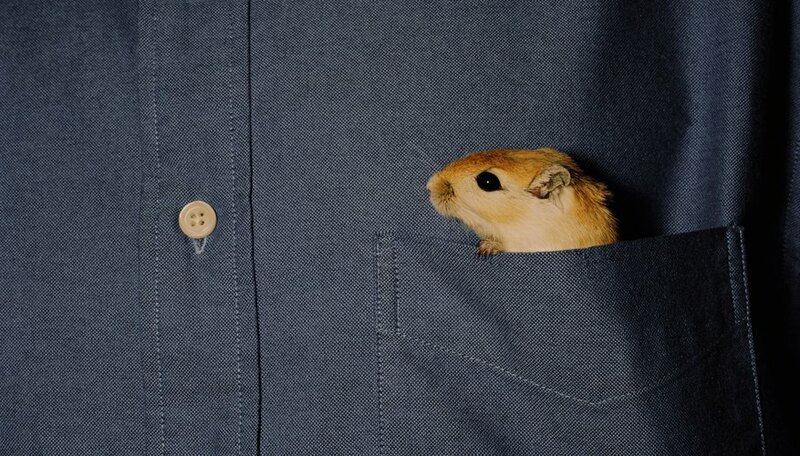 If a gerbil senses danger, it will often thump its tail. The thumping warns other gerbils nearby that danger is present, and the other gerbils will also start thumping or dive for entrances to their burrows. Only one family of gerbils will live in each burrow, but the burrows are very extensive, containing nest areas and storage areas for food. There is always more than one entrance to a burrow, so if a predator such as a snake enters the burrow, the family of gerbils has a way to escape. Talmadge Walker is a former schoolteacher turned professional writer. He has a bachelor's degree from Birmingham-Southern College and a master's degree in special education from Elon University. Talmadge is a volunteer historic interpreter at the Bennett Place State Historic Site. Walker, Talmadge. "The Adaptations of Gerbils." Sciencing, https://sciencing.com/adaptations-gerbils-10046672.html. 25 April 2017. What Is the Natural Habitat of Camels?